Packed full of flavor, these make-ahead Curried Pork Empanadas are always devoured when we serve them at parties. 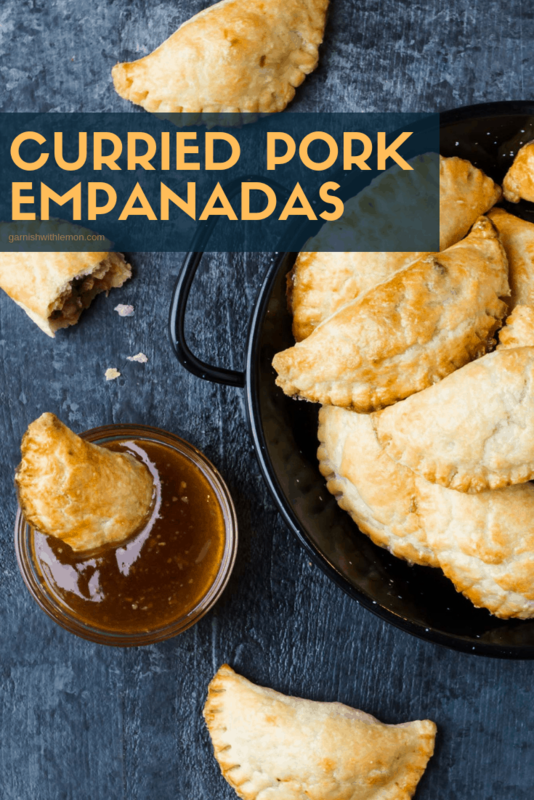 These mini Curried Pork Empanadas may not be traditional from a filling perspective, they are spot on in the flavor department – utterly delicious! They are a delicious, hot, make-ahead appetizer for your next party. There are numerous recipes for empanadas that use refrigerated pie dough. 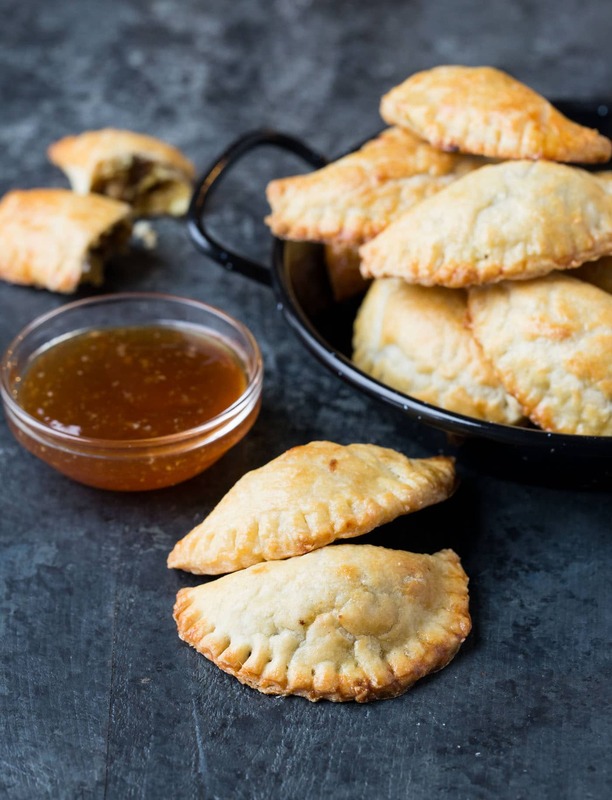 That’s a great shortcut when time is tight, but this version of Curried Pork Empanadas uses homemade dough, and that little bit of extra effort is totally worth it. Empanadas are widely found in many Hispanic cultures. The preparation technique and fillings may vary, but they are all essentially meat pies at heart. This version makes mini empanadas with a curried pork filling and is baked, not fried (slightly healthier, right?). Can you make these Curried Pork Empanadas ahead of time? AND they can even be baked earlier in the day and reheated before guests arrive. 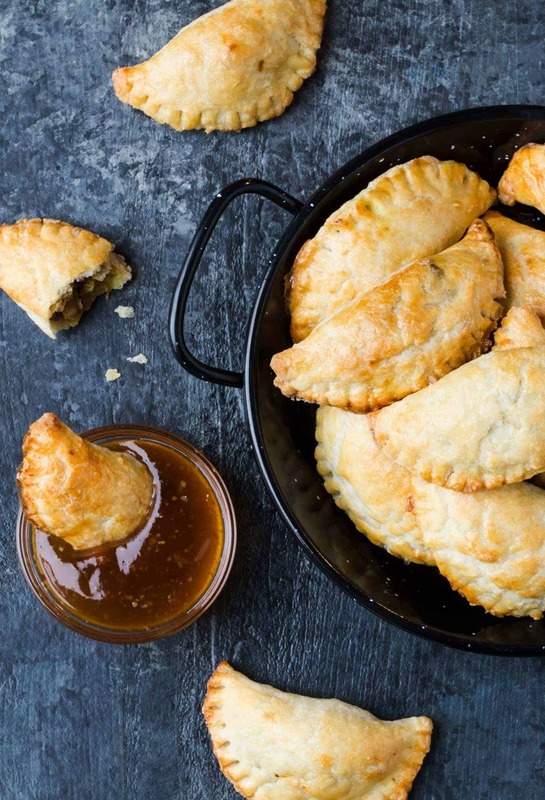 Will the crust get tough if you bake these empanadas ahead of time? I feared the same thing but I shouldn’t have worried. The butter and cream cheese combination ensures the crust stays super tender and flaky, even after reheating. Score one for the host! You can even freeze these Curried Pork Empanadas! Simply place the empanadas in a single layer on a cookie sheet and freeze for a few hours. Once frozen, place empanadas in a freezer safe bag or container. You can them bake them straight from frozen state and add a few extra minutes to the baking time. What do you eat empanadas with? Authentic Argentinean empanadas are not traditionally served with dipping sauce, but we’re a family of dippers at heart, so I had to offer at least a few choices for those fellow dippers out there. I opted for a sweet mango chutney and ginger-soy glaze (both purchased at the grocery store), and they were great complements to the empanadas. Add some flavor to your appetizer spread with this recipe for homemade Curried Pork Empanadas. Serve with a dipping sauce and watch them disappear! Add cream cheese, butter and 1/4 teaspoon salt to a medium bowl. Use an electric mixer to mix until combined. Gradually add the flour and mix until just incorporated. Form two rounds of dough, dust with flour and wrap in plastic wrap. Refrigerate at least one hour. Heat a skillet over medium high heat. Sprinkle 1/4 teaspoon of salt in the bottom of the pan and add small pieces of the ground pork to the skillet. Don't stir the pork, just let it brown. When one side is browned, carefully turn the pork pieces over and brown on the other side. Remove from skillet when browned on both sides. Add olive oil to the pan and return it to medium heat. Add the onions and saute until the onions are translucent. Add the garlic and mushrooms and cook for 2 minutes. Mix the curry and ginger into the onion mixture. Return the pork to the pan and add the sherry, soy sauce, sugar, cornstarch and raisins. Mix well. If the pork pieces are too big, break them up with a spatula. Refrigerate meat mixture if not making empanadas right away. Preheat the oven to 375 degrees. Remove one of the rounds of dough and let it set for 5 minutes to soften. Sprinkle some flour on your rolling surface and roll out the dough so it is about 1/8 inch thick. Cut circles (mine were 3 inches) from dough and place them on a baking sheet lined with a silicone baking mat or parchment. Using a pastry brush, lightly brush the inside edge of the dough circles with the egg wash. Drop a teaspoon of the pork mixture inside the dough circles, being careful to keep it away from the edges of the dough. (Stray pieces of pork don't allow the empanadas to seal properly and they pop open when baking.) Fold the dough circles in half and seal the edges. If you want to fancy them up, you can twist the edges together with your hands (like a pie crust) or use the tines of a fork to flute the edges. Brush the outside of the empanadas with egg wash and bake for 15 - 20 minutes or until golden brown. Repeat with remaining dough round. Serve warm with dipping sauces, if desired. Chill the unbaked empanadas for 10 minutes after you fill and seal the pastry rounds but before you add the egg wash and optional tine marks with the fork. If the dough is too warm/soft, the tine marks will not remain very visible after baking. Recipe barely adapted from Simply Recipes. These sound so good. I love curry anything, and have curry powder in the cupboard, but I never really know what to do with it. This is going on my list of recipes to try for sure!